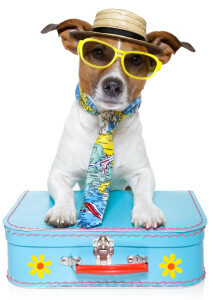 1) Start preparing for traveling with your pet as soon as possible and give your self plenty of time to plan your trip. We recommend contacting the embassy of the country you are traveling to find out what is required. You may not realize it, but certain countries have very strict travel regulations for pets. Certain countries require that your pet has an international microchip and may also require special blood testing (such as rabies vaccination titer / FAVN tests) and other tests to guarantee your pet is disease and parasite free. This may need to be done a month or more before your travel date depending on the country you are going too. Knowing this information ahead of time will prevent you from being stuck at the airport & finding out last minute that your pet will not be your travel buddy! 2) Contact the airline you are using to find out what requirements they have about bringing pets on board & what types of carriers they require. Some airlines will allow your pet to be with you in the cabin, but some will not. It is also a good idea to get your pet used to the airline carrier before you travel. We recommend natural supplements such as rescue remedy to keep your pet calm while traveling with you. 3) Make an initial appointment with us (or another USDA accredited veterinarian) early to ensure that you will meet all the requirements for your pet to successfully travel with you. We recommend making an initial appointment at least 30 days prior to your flight. This will ensure that if an international microchips or any other special requirements such as blood tests are needed, you will receive the documentation & required certification (see below) in time for your flight. FYI: the rabies titer test or “FAVN test” usually takes a minimum of 30 days to receive the test results – this test is run at a special laboratory (Kansas State) and is a very important requirement for many countries. After you receive these results you will still need to get all your documents certified prior to your flight. Because of these strict requirements, some unfortunate pets have been unable to share a special trip with their owners; or worse risk getting stuck in quarantine – because this test was not done in enough time prior to travel. 4) Make an appointment with us 7 to 10 days prior to your flight for the official international health certificate. All countries require a USDA-approved accredited veterinarian to examine your pet within 10 days prior to your flight date to ensure that your pet is disease and parasite free and healthy enough for international travel. After your pet receives his or her checkup and verifies your pet meets the requirements, you will obtain the international certificate and your travel documents for your pet. Also remember, you will need to have your pet examined by a veterinarian in the country you are traveling to in order to get a certificate to travel back home. We understand that traveling with your pet & meeting the stringent requirements for the country you are traveling to may seem at times to be a daunting task …… but we hope this information helps you to plan for your trip. Remember – by planning ahead & leaving enough time to plan and prepare for your trip you can ensure that your best friend travels with you & does not get left at home! If you have any questions about scheduling an appointment for an International Travel Health Certificate with your Pet please contact us. Please note – each country has individual requirements that are very different so we do recommend an appointment as early as possible prior to travel so that the veterinarian can review all prior records and ensure that your pet meets all the requirements. Usually more than one appointment is required to assure your pet receives all the necessary documents to be your travel companion.